The best testament of how original a particular type of food is when the country’s native citizens show up to eat it. 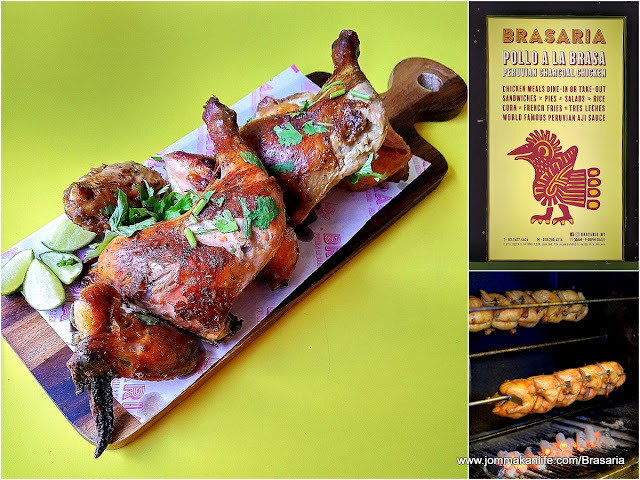 So imagine how chuffed Carmen Loo – owner of Brasaria restaurant was when Peruvian customers showed up to enjoy Pollo a La Brasa, Peruvian-style rotisserie chicken at Brasaria recently. Opened in February this year, Brasaria has steadily won plaudits for its delicious charcoal-grilled chicken. According to Carmen, the restaurant uses chickens from a halal-certified supplier. The chooks are marinated for 24 hours with the house Peruvian-style marinade. In sync with this casual, simple food approach, the owners have kept Brasaria’s interior uncluttered and functional. At the entrance, a whimsical Ilama replica ‘greets’ diners while solid blocks of colour accents evoke vibrant vibes inside. The straightforward menu proffers grilled chicken in quarter, half or whole servings. Our dining party opted for El Jefe ‘The Boss’ (RM45.90 whole chicken a la carte, RM60.90 whole chicken with large green salad & 2 sides). We wolfed down the delectable Peruvian chicken within minutes and thoroughly enjoyed every bite of the tender, juicy chicken. For variation in flavour, dip chunks of the meat into the house Aji Mild and Aji Hot sauces. Made using different amounts of aji amarillo peppers with coriander, garlic, vinegar and mayonnaise, some preferred the milder creamy green dip while others went wild over the feisty hot version. There is also fruity BBQ Peruano sauce. “Most Peruvians will supplement their chicken feast with rice or potato fries and grilled veggies,” explained Carmen. “Our customers prefer the Latin Trio (RM5).” We soon discovered why − the slightly charred sweet potato, plantain and pineapple had such homespun appeal, it was easy to succumb to their basic, comforting taste. I was also partial to Elote (RM5), grilled corn cob slathered with aji sauce, chilli powder and cheese. The buttery and fragrant Brasaria Rice – Peruvian yellow rice with raisins (RM5) was heartily satisfying. Ditto for the addictive Salchipapas (RM5), deep-fried French Fries (RM5) with strips of fried chicken frankfurters and a choice of house sauces. Grilled Vegetable (RM5) comprising eggplant, zucchini, carrot and capsicum dices tossed in a piquant sauce made a complementary side to the overall equation. Pasta lovers may like to sample El Tallarines (RM14.90). A typical spaghetti dish tossed in Peruvian pesto with shredded roast chicken and a sprinkling of cheese, it won the day thanks to the dish’s fresh herbaceous and nutty-savoury accents. After that stellar line-up, we reckon El Sanguche ‘The Sandwich’ (RM14.90) paled by comparison. Okay, the soft roll filled with hand-pulled chicken with mixed greens, aji sauce and salsa criollo was decent enough but was nothing to write home about. Since no dessert was available that day, we made do with Agua Fresca (RM5), a refreshing drink made with fresh fruit of the day as the palate refresher. For reservations, call Brasaria, tel: 03-7627 4626. Address: D-59-G, Block D, Jaya One, Petaling Jaya, Selangor.